Return equipment to service immediately when you make leak-proof gaskets in just one minute with the Right Stuff.® This latest elastomeric rubber gasket technology is blowout resistant and outperforms pre-cut gaskets. Specified on production lines by GM, Ford, DaimlerChrysler and Mercedes-Benz. Temperature range -75°F to 450°F (-59°C to 232°C) continuous, 500°F (260°C) intermittent. ; resists ATF, coolant, oil and other shop fluids. 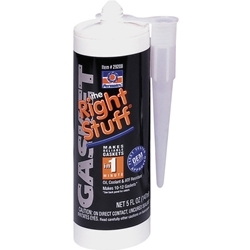 Protects against leaks caused by vibration and thermal expansion. Sensor-safe.